What is the SOT Annual Meeting? When and where is the SOT Annual Meeting? Who attends the SOT Annual Meeting? How do I get a copy of the final Program? Is it too late to submit an abstract for the SOT Annual Meeting? What are the locations and dates of future SOT Annual Meetings? I’m in the press. Can I attend the SOT Annual Meeting? Who can I contact with press questions or issues? How do I register for the SOT Annual Meeting and what is the registration fee? What does SOT Annual Meeting registration include? When/where can I pick up my registration materials? Is there guest registration for the SOT Annual Meeting? Is a one-day registration offered? How do I register for the Past President’s Fun Run? How do I register for the In Vitro Luncheon? book and electronic book (“ebook”)? I signed up as an Expert, Postdoc, or Student for the "Chat with an Expert" program. Where do I meet the group before adjourning for the chat session? Who can I contact with Housing questions or issues? What is the SOT Headquarters Hotel? Are there any shuttle buses? What is the recommended arrival airport? What is the Continuing Education Program? Will there be free Wi-Fi at the New Orleans Ernest N. Morial Convention Center? How do I request an Ancillary Meeting? Who exhibits at the ToxExpo? Who can I contact with exhibitor questions or issues? Where will the posters be displayed? What is the difference between an abstract number and a poster board number? What is the online Job Bank? What is the onsite Job Bank Center? How does the Job Bank Center work? How do I sign up for the Job Bank? The SOT Annual Meeting is the largest meeting of its kind, dedicated to advancing the science of toxicology. This annual event features a broad range of scientific sessions and a thematic program that provides participants with a unique opportunity to deepen their knowledge in topical areas and interact with leaders in their respective disciplines. The scientific program includes a plenary session, the MRC Lecture, symposia, workshops, roundtable discussions, informational sessions, regional sessions, as well as platform and poster sessions. The Society anticipates that more than 6,500 toxicologists from more than 50 countries will attend. The SOT Annual Meeting also includes the ToxExpo, which is the largest exhibition in the world dedicated to toxicology and the biomedical sciences. ToxExpo features 350 exhibitors, who lead the industry in developing cutting-edge products, services and technology to benefit the toxicology community. 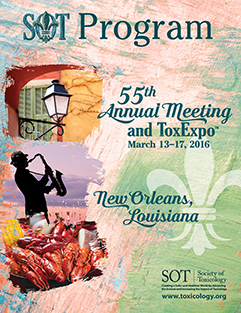 The 2016 Society of Toxicology Annual Meeting will be held at the New Orleans Ernest N. Morial Convention Center, New Orleans, Louisiana, March 13–17, 2016. Continuing Education courses will be held on Sunday, March 13. Sessions are scheduled to begin the morning of Monday, March 14 and end Thursday afternoon on March 17. During registration by February 12, you can request a copy of the Program to be mailed to you (US and Canada only) for a fee of $20. Otherwise, you can pick up a copy at the on-site SOT registration desk of the New Orleans Ernest N. Morial Convention Center. An attendee listing is on the SOT Annual Meeting App, available for download in late February from the Annual Meeting website. An attendee mailing list is available for purchase and can be ordered using the Attendee List Request Form. The abstract submissions deadline is October 7, 2015.